“Willem Mengelberg, like Henry J. Wood, spent half a century with an institution classifiable as a national monument: from 1895 to 1945 he was music director of...the Amsterdam Concertgebouw. Like Arthur Nikisch he was an early example of the commuting conductor and regularly departed Holland 1907 to 1920 for concerts in Frankfurt. Mengelberg remained in Europe after 1930, recording for Columbia until the Depression cut into recording budgets, then for the German firm Telefunken. With the coming of the war Mengelberg accepted the Nazis…to conduct and record – meanwhile saving at least sixteen Jewish members of his orchestra and…defying the ban on playing Mahler. 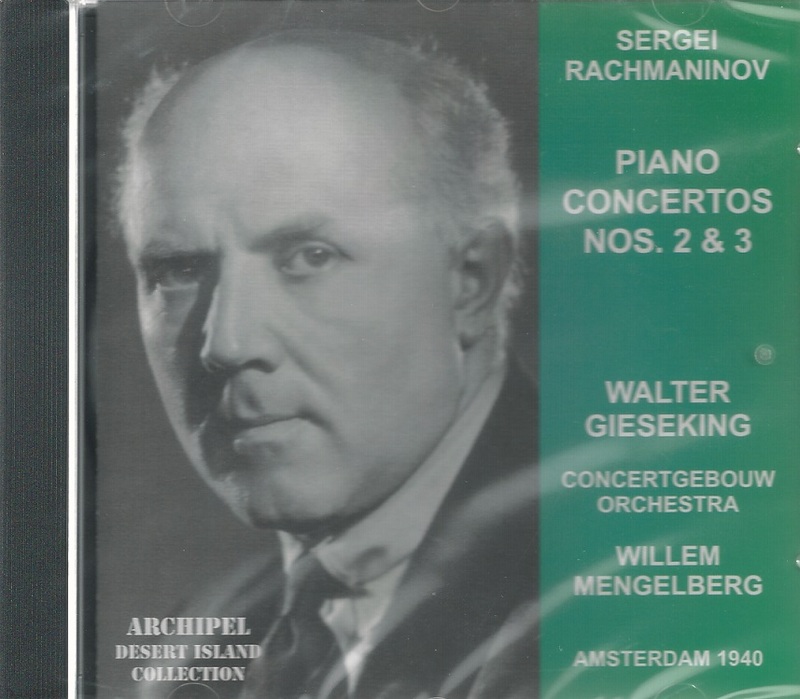 Dr. Berta Geissmar, Wilhelm Furtwängler’s Jewish secretary, has written in TWO WORLDS OF MUSIC about the kindnesses extended by Mengelberg on her Amsterdam visits in the late Thirties, and there are other examples of his natural non-partisan good-heartedness. Politics bored Mengelberg….He lived, in a sense, on his own special island, a monarch among invaders as well as a prince among friends….his soul was drenched in music. 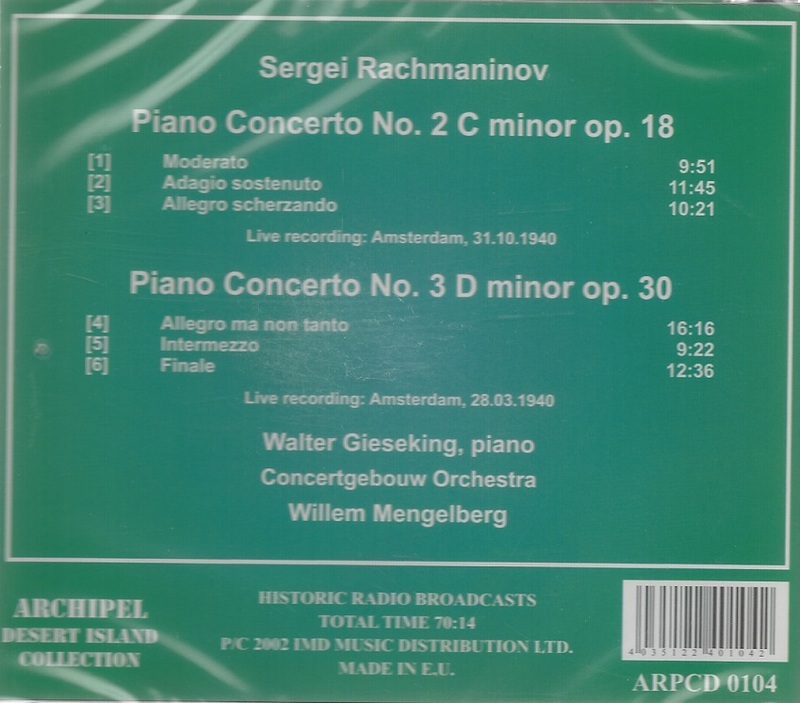 With virtually every performance he was living in the music’s lining and hurling himself at the barricades of interpretation....It’s not surprising that Otto Klemperer, rejected by the Third Reich, conducted a memorial concert for Mengelberg in Amsterdam shortly after his death. 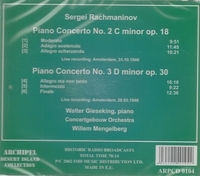 “It was with the repertoire of French masters that the German pianist Walter Gieseking became most famous. The impressionistic piano writing of Claude Debussy and Maurice Ravel required the most sensitive touch and attention to color and nuance, and Gieseking's finger acuity, imaginative pedaling, and above all, preternaturally alert ear made him an ideal interpreter of this music. Nevertheless, his own repertoire ranged widely across eras and national boundaries. Under the tutelage of Karl Leimer, he made his début in 1915. Gieseking was drafted into the German army a year after his first public performance but escaped combat by performing in his regimental band. After the war, he undertook the the life of a working musician, accompanying singers and instrumentalists, playing in chamber music ensembles, and working as an opera coach. He could hardly avoid the heady artistic atmosphere of postwar Germany, and he became an advocate of new music, playing works by Schönberg, Busoni, Hindemith, Szymanowski, and Pfitzner, whose Piano Concerto he premiered under Fritz Busch in 1923. Subsequent débuts in London (1923), the United States (1926, Aeolian Hall, New York), and Paris (1928) were highly acclaimed, with audiences and critics responding enthusiastically to Gieseking's subtle shadings and contrapuntal clarity.